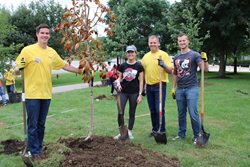 DHL Supply Chain, the Americas’ leader in contract logistics and part of Deutsche Post DHL Group, and The Ohio State University partnered to plant 30 trees near the Schottenstein Center. DHL Supply Chain made a contribution to purchase and care for 30 new trees to help support urban forestry in the Columbus area. DHL Supply Chain also purchased and donated 1,000 tonnes of carbon credits for Ohio State to contribute to the university’s own carbon reduction goals. Ohio State matched DHL’s donation by purchasing an additional 1,000 tonnes of carbon credits. A single carbon credit is equal to one metric ton of CO2 removed from the air. The 30 newly planted trees and credits purchased by DHL and Ohio State reduce greenhouse gases equivalent to taking 400 passenger vehicles off the road for one year. Ohio State will use these credits to offset a portion of the University’s annual greenhouse gas emissions, such as those from its own transport fleet. The program is being facilitated by North Carolina-based Urban Offsets. DHL Supply Chain and Ohio State have a long-standing relationship where DHL provides internships, guest lectures, teaches courses, offers students site tours of local facilities and fills two seats on Ohio State’s supply chain Center of Excellence board. Since the Fall of 2015, DHL Supply Chain has hired 79 interns and 78 full-time Ohio State students as full-time employees. This tree planting provides an opportunity for students from Ohio State’s Fisher College of Business and the Center of Operational Excellence (COE) to learn more about DHL and interact with DHL Supply Chain executives and associates. DHL Supply Chain’s GoGreen program has delivered an average reduction of 3 percent in carbon dioxide emissions, year over year, for every mile travelled and every square meter of space used worldwide for its customers. For more information about DHL Supply Chain’s GoGreen Solutions, click here. Ohio State University is a dynamic community of diverse resources, where opportunity thrives and where individuals transform themselves and the world. Founded in 1870, Ohio State is a world-class public research university and the leading comprehensive teaching and research institution in the state of Ohio. With more than 66,000 students (including 60,000 in Columbus), the Wexner Medical Center, 15 colleges, 80 centers and 200 majors, the university offers its students tremendous breadth and depth of opportunity in the liberal arts, the sciences and the professions. Urban Offsets is the global leader in hyper-focused sustainability. We help companies and universities reduce their environmental impact by investing in sustainability projects around the world and directing profits into local projects that build climate resilient neighborhoods. Since 2017, more than 80,000 metric tons of CO2 emissions have been offset and 12,000 trees planted in at-risk communities around the country. Find a project close to you on the Urban Offsets Registry (http://registry.urbanoffsets.co/).